our perfectly imperfect life: Payton lost the fight. WARNING ... this post is not for those with a weak stomach. Don't say I didn't warn ya. Because I did. This afternoon, I was making dinner in the kitchen, enjoying life as all three of my kids had themselves happily encompassed in separate activities not more than 15 feet from me. Nobody was bothering anyone. Until ... Payton started crying. Crying loudly. Screaming. Screaming at the top of her lungs. 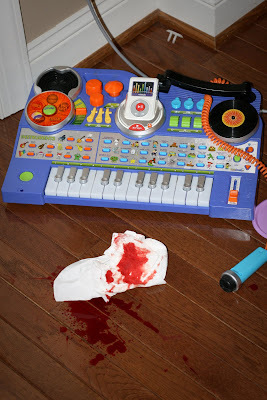 Clearly this picture was taken after I removed the culprit from the scene and tended to my daughter. But you get the picture. 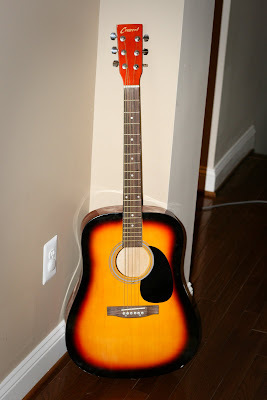 This guitar had been leaning in the corner behind the piano that Payton was playing with. She must have moved the piano in such a way that it bumped the guitar, causing it to fall. It fell on her. On her head. 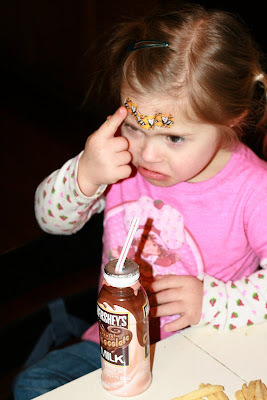 It hit her right smack dab in the middle of her forehead. There was blood everywhere, gushing out of her forehead. A huge pile of blood on the floor as you can see above. I immediately put pressure on her forehead and yelled for Mason to get me some paper towels. The thing would not stop bleeding. I completely panicked and knew I had to get her to the hospital, but I wasn't sure how I was going to do that with me, three kids and a gushing forehead. I applied pressure for several minutes until the bleeding slowed down. In the interim, Mason got me the phone so I could call for help. The only problem was my mind was racing so fast that I could barely remember anyone's phone number. I called my friend Jodi who lives around the corner first ... I figured she could get to me the fastest. NO ANSWER. I called my sister several times. NO ANSWER. I called my husband several times. NO ANSWER. I called my mom several times on two different cell phones. NO ANSWER. Those were the phone numbers I knew off the top of my head. My cell phone was elsewhere in the house and I couldn't get to it. I knew I needed to call my sister-in-law, but my brain was not functioning. So ... I have to apologize to the person whose phone number is 414-659-1271 ... I really didn't mean to bother you and I'm sorry if I sounded like a frazzled lunatic ... but at that moment I was. That phone number would be the area code of my sister-in-law's cell phone, combined with portions of my fax number. I finally pulled myself together and got her number right. SHE ANSWERED. Thank God for her! She said she'd meet me at the hospital and off we went. On our way there, I finally reached my mom and Kyle, both of whom planned to meet me at the hospital too. After having Payton's wound numbed and cleaned, I was amazed at how tiny the gash was. The strange thing was that it looked like a hole in her head ... probably about 2mm in diameter. Who knew that so much blood could come from such a small gash? The RN decided that Payton needed to have stitches and agreed that liquid stitches would do the trick. Phew. But nonetheless, I knew Payton would put up a good fight. We had to restrain her using a pillowcase ... thank God the actual closing of the gash didn't take that long. Although, just a few seconds of what we experienced seemed like an eternity. Now I'm off to find that damn guitar ... it is going in the trash! Poor sweet baby. Is it ever boring around there? I hope Payton's head feels better soon! Oh, man, what an adventure you guys had today! Hope this doesn't affect her musical career! oh poor baby! I feel your pain and I have scars from stitches on my foorhead at least twice.. so trust me when I say I feel your pain GWS! Awww...poor sweet thing! I would have TOTALLY paniced too, and been in the same situation of no one answering there damn phone! Especially my DH. I know he looks at his phone (cuz I've seen him do it), sees the number and puts it straight to vmail. It drives me insane!! What if I were calling about something important!!! That's alot of blood too. Aren't cuts in the head notorious for bleeding alot? ugh. Oh man, Chicky! :'( So glad that she's ok! I promise I am not laughing at your feeling of panic in the moment! I'm going to assume this is your first experience with stitches. I hate to tell ya, but there are more coming! 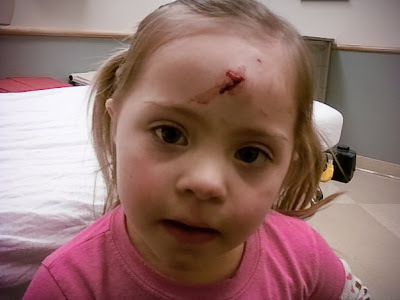 Angela is the only one of my kids who hasn't had stitches from an injury! LOL I'll have to blog about some of our experiences with stitches. And always remember, heads bleed worse than ANY other part of the body, with the exception of a severed artery (which I have seen!) The head always fools you into thinking the child is going to bleed to death. The good news is, you've all survived! Something I have learned along the way though....any injuries to the face I have fixed by a cosmetic surgeon! The ER calls the cosmetic guy in, and we wait till he/she gets there. A couple of times we've had to meet him at a different hospital. The difference in how the scar looks later compared to a regular 'ol ER fix is incredible. Oh no! Shame! It looks really sore! I hope that Payton feels better soon! I imagine I would have acted the same way you did! I am so glad all is okay, that last picture of her is pitiful. And the picture of her in the hospital, the cut looks really wide! Feel better Payton!!! You did good Mommy. Here's hoping she heals quickly and feels better fast. As I'm reading this I look at my home phone and see that I had 3 missed calls from you! I would have been just as flustered. So sorry I wasn't home. I was actually coming back from a doctor appointment. Glad she is ok now! :( Poor baby girl. I hope she feels o.k. today. I hope she's feeling better today. Poor Chicky! That is a lot of blood, I would of been freaking too. Poor baby! Glad she's ok. Head bleeds are the worst. That is a lot of blood on the floor. Thank goodness it did not get her eye or somewhere worse. Whew! You have as much chaos in your house as me!! C'mon.....admit it! Never a dull moment!!! Glad she's ok! I don't know what I would do if someone got hurt at my house..it IS hard to do anything quickly with 3 children...I think I need to make a plan incase that does happen. Oh poor sweet girl. I bet she was soo tired at bedtime. I wish I was there to love her up. I'm sorry you had to go through that. I know how it feels we have been there with both the boys- one with a baseball between the eyes-blood everywhere and the other one with the dog bite in the face yuck.. I hope she heals up soon!!! How scary for her - and you! It is unbelievable how much those head wounds bleed, isn't it?? Glad that she is ok! Oh, poor girl! Hope she feels better soon. That last picture is so cute, tho. I can't imagine how hectic everything must have been. Maybe I should program my speed dial in case of mind numbing emergency! Oh My Goodness...I cant believe a guitar did that to her poor little head. PTL it was able to be mended with the glue. Taylor had one of those too. Corner of a wall. Same thing with the liquid stitches. It did leave a scar but I was told since she still has growing to do that it should fade with age. Hope she's feeling better! OHHHHH my goodness! That last picture is sooo precious! Sad but sooo adorable! I am so sorry this happened! I hope she is feeling better and I hope things heal just fine! POOR baby! I have had stitches a TON of times...just something about my luck! Poor baby! I would have totally freaked out too!!! I'm glad they were able to do liquid stitches! Yikes!! That's so scary. Poor Payton! What a brave girl! Hope she forgets all about it soon. Poor sweet Payton. I hope her boo boo heals quickly. We've had a few run-ins like that. The ER nurse keeps telling me that the head is very vascular - hence all the blood. Payton you are a strong lil lady! Take up Guitar and teach that thing a lesson!